A few months ago, Bénédicte Tilloy posted her aquarelle paintings on social networks. She is ex-head of HR and a member of the SNCF Réseau executive committee. Her creations all illustrated company values. Grenoble Ecole de Management (GEM) students contacted her to learn more about this experience. Last June, GEM students asked Bénédicte Tilloy to display her artwork at the school and participate in a conference on the subject of art and management, which was organized by Marc Prunier, head of the periScope laboratory for educational innovation, and a professor of information systems management and service engineering. The exhibit served to wind down the general management program in which 20 SNCF employees had participated. For Bénédicte, aquarelle painting enabled her to illustrate various company values such as audacity, cooperation, integrity, listening, sharing and respect. "Art is a gateway to emotions. It can make us vulnerable and this can be scary for someone whose job is to lead and represent authority. But, we have to think about how we can use emotion. When you're dealing with a complex situation in terms of human relationships, expressing vulnerability creates honesty. If you can be vulnerable, other people you interact with can also feel free to express true feelings. It builds trust. For example, this helped me create honest and respectful relationships with union representatives. You can overcome a crisis with greater ease. If one of your employee's is the victim of serious violence, an image can be much more powerful than words," adds Bénédicte. "By 'allowing' myself to post aquarelles on my Twitter account, I unknowingly helped SNCF employees share their passions. For example, one of them contacted me on Twitter to ask for help launching a project he cared about," says Bénédicte. 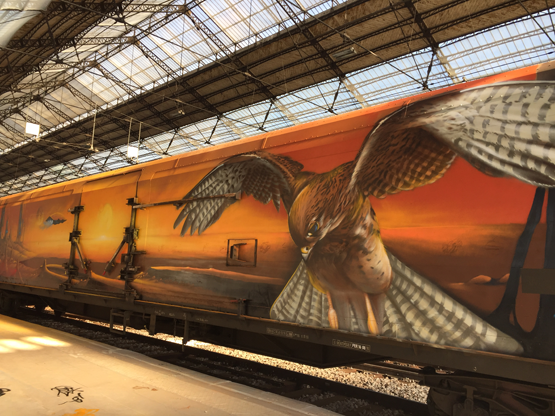 The result was the launch of Art Wagon, an event in October 2016 during which 10 street artists transformed a freight car in the Austerlitz train station in Paris into a work of art. "The event was a great success on social networks and it sent a message to all of our employees that we could create great things through collaboration and audacity. In addition, the train driver who launched the project lost his job, but was able to go back to school and advance to a more interesting job," highlights Bénédicte. "Thanks to this train driver, thousands of SNCF train drivers could see a different image of SNCF management. Carrying out artistic initiatives is a great learning platform for project management and implementing otherwise complex goals," concludes Bénédicte.